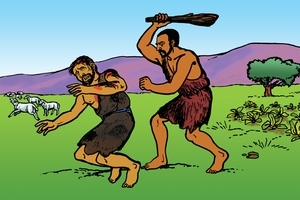 Outline: Account of the two offerings made by Cain and Abel and the subsequent events. Application. Needs revision to be meaningful to those with insufficient background. Cain and Abel were the sons of Adam and Eve. Cain was the firstborn, and Abel was the second. Cain was a farmer, and Abel was a shepherd. After many days Cain made a sacrifice to God from the fruit of the land. Abel brought the best sheep of his flock to God. God accepted Abel's sacrifice, and looked on his sacrifice. But God did not accept Cain's sacrifice, and did not look upon it. Because of this, Cain became angry and his face was dark. God said to Cain, "Why is your face angry and dark? If you do the right work in God's sight, you will not lift your eyes up, and if you do not do the right thing in God's sight, your sin will not be forgiven." Because Cain was jealous of his brother, he killed Abel. Later God asked Cain where his brother was. Cain answered, "I am not the shepherd of my brother." And God said to Cain, "What did you do to your brother? His blood cries to Me from the earth. Now you are cursed because you have shed your brother's blood and the earth has received thy brother's blood." My friend, why did God not accept Cain's sacrifice? According to the law, men cannot be cleansed from their guilt without blood. "And almost all things are by the law purged with blood; and without shedding of blood, is no remission."(HEB. 9:22). Second, Cain brought his own work which he worked, as a sacrifice. He did not shed a lamb's blood for his sin. Because of this, God did not accept Cain's sacrifice. Today, however, we are saved by the gift of God. We cannot be saved by our works or the shedding of a lamb's blood. "For by grace are ye saved through faith, and not of yourself; it is the GIFT of God, not of works--lest anyone should boast." (EPH. 2:8:9). My friend, in olden times, man, in order to make himself right with God, sacrificed a goat, or sheep, or bulls, or doves. But today man cannot be saved by the blood of any animals. These cannot cleanse him from sin. Today we are saved only by the blood of our Lord Jesus Christ. Only the blood of the Son of God, cleanses from sin all who accept and believe in Him. My friend, God will help you to believe only the Lord Jesus Christ and be saved. GRN has recorded a version of this script in 14 languages and dialects. See full list.